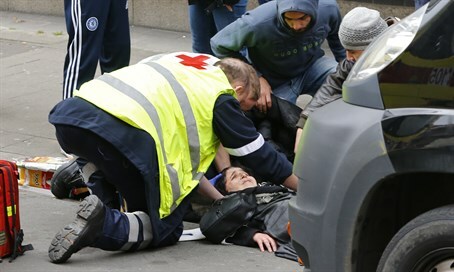 Driver runs down Muslim woman in Brussels, as hundreds protest Islamic terror following bombing attacks. Hundreds of protesters descended upon Brussels' Molenbeek neighborhood, despite a police lockdown, to demonstrate against the city’s Muslim population. Molenbeek, known for its large Islamic population, was rocked by angry protests on Saturday as anti-Muslim demonstrators squared off against riot police. Water cannons and mounted police were called in to break up the demonstration. During the protests a car broke through the police line protecting the neighborhood and rammed full speed into a pedestrian crossing the street. The hit-and-run appeared by all accounts to be intentional, though no formal motivation for the crime has been suggested by police. The victim was a Muslim woman in traditional Islamic garb. First responders reported that the victim was wounded but conscious after the incident. Police quickly surrounded the car involved in the hit-and-run, battering it with batons until the driver was removed and arrested.